These pieces are terrific fun to make, and the result will give you a bag to contain a gift for a friend or loved one - or to keep yourself! The kits contain everything you need to make the piece, and when you have worked the stitched design the instructions tell you how to stick the pieces together using a glue stick or liquid glue. The kits contain 14-count perforated paper, lining paper and ribbon, thread, needle, thread card, tissue paper, chart and full instructions. 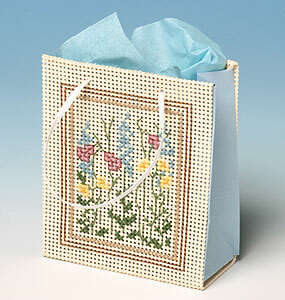 Worked on ecru coloured paper, this little bag is decorated with pretty meadow flowers. The inner bag is made from light blue paper, with the same coloured tissue lining and white ribbons. It stands about 9cms high.